The Medal for Excellence in Translation is a major national award that recognises outstanding achievement in translation. This award celebrates the vital role of translators and translation in Australian culture and scholarly discourse. It adds to the growing recognition of work in this field which recognises lifetime achievement. The Medal is awarded biennially for a book-length translation into English of a work of any genre (including scholarship) from any language and period. The winner of the Medal for Excellence in Translation receives a medal, certificate and monetary prize of $1000. The inaugural medal was awarded in 2016. The Academy wishes to acknowledge the generous support for this award by the Copyright Agency’s Cultural Fund, Monash University, the University of Melbourne and the University of Western Australia. 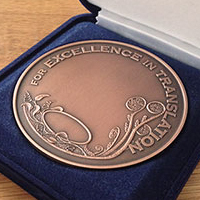 Nominations for the Medal for Excellence in Translation will open in 2020.